My friend Kerry was married in December in a gorgeous Alice Temperley gown which begged for a vintage-style wedding theme. I wish I had known about Dizzy Wizzy Design back then, as I would have sent Kerry straight there to pick her invitations. Natalie's retro styling is bang on-trend and perfect for a vintage-style wedding. 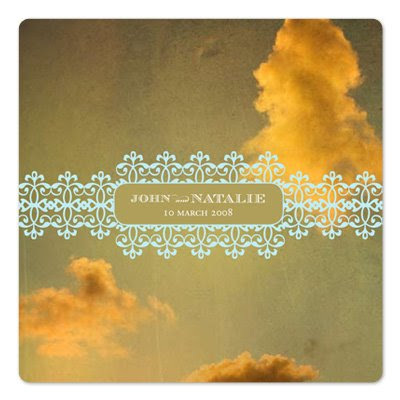 Graphic designer Natalie Sullivan launched custom stationery line, Dizzy Wizzy Design , in October 2008. 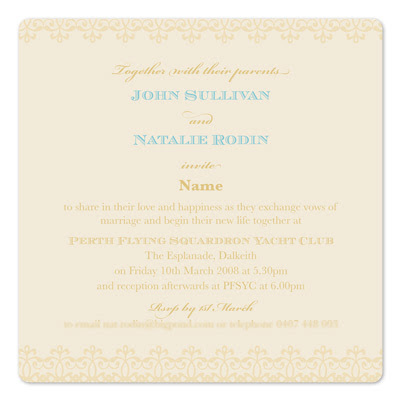 Based in Perth, Natalie designs one-of-a-kind couture wedding stationery. Make sure you also check out Natalie's customisable birth announcements, Christmas cards and social stationery. I have also fallen for her "Circus Circus" birth announcement. You can order directly from Natalie at the Dizzy Wizzy online Shoppe or selected items through Minted.com. And check out Natalie's blog for more behind-the-scenes information. P.S. Curious about Kerry's wedding? See the pics here. love the pale blue detail over the sultry sky! Hi Caroyln - me too! So clever. I really don't think I've ever seen a wedding invitation quite like this. Hi Kim - tell me about it. Ah to go back.... and a renewing vows ceremony just doesn't quite seem to cut it. I'm glad you like them - thanks for visiting!